A social security card is issued by the Social Security Administration upon hospital birth within the U.S. and remain active as long as you are alive. It contains you first and last name as well as a 9-digit number. If you have a Lost Social Security Card Click Here to submit for a replacement online in just minutes. You need this number to obtain a job, pay your taxes and benefit from many government services such as disability and retirement benefits. Some third party agencies such as colleges, banks, credit card companies and other businesses like to use social security cards for identification. This is because no one else can have your unique SSN. If your social security cards get lost or stolen, you should get a replacement as soon as you can. You should also get a replacement if your card gets damaged from wear and tear. But first, you have to report the loss to local authorities to prevent possible identity theft. Everyone is permitted a total of three card replacements within a one- year period and 10 replacement cards in your lifetime. You can however be exempted from these restrictions if you can prove that the losses were a result of significant hardships. 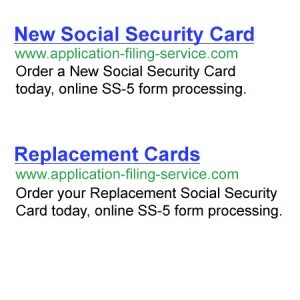 Until 2016, the Social Security Administration (SSA) required you to either visit a Social Security office or download the Social Security Card replacement form SS-5 and mail it in to receive a replacement card. The form SS-5 had to be signed, dated and presented along with supporting documents such as a state identification card, a U.S. issued driver’s license or a U.S. issued passport to confirm your U.S. citizenship and identity. However, the SSA rolled out a program where you can apply for a replacement card online and have it mailed to your address without having to download any forms. The SSA now uses public records from listed states to verify your identity online. All you need is a state-issued ID card to apply for a get a replacement card online. We offer private value added services to customers who want to apply for lost social security card in a simple way. This will save you the hours and even days of research you will have to conduct in order to accurately fill your application form so that it gets through without glitches. The service includes line by line application assistance, list of documents for submitting the application and information on where to submit the documents in order to have your card replaced within the shortest amount of time. Keep it safe, never worry about a Lost Social Security Card! Due to the many security concerns associated with social security cards, it is important to keep your card in a secure location all the time. Also remember not to give out your social security number to anyone unless they are a trusted authority, since there are many scams involving use of stolen personal information. Do not ever send your social security number via phone text messaging, email or on social media sites that can be hacked and the information easily retrieved. If it gets lost, contact fraud units of the 3 major credit reporting bureaus to place an initial fraud alert, use only secure processing online.